At an offsite meeting on Monday, November 30, members of Ventura Rotary South gathered on a blustery hillside in Grant Park above the City to learn about ambitious plans for the Ventura Botanical Gardens. 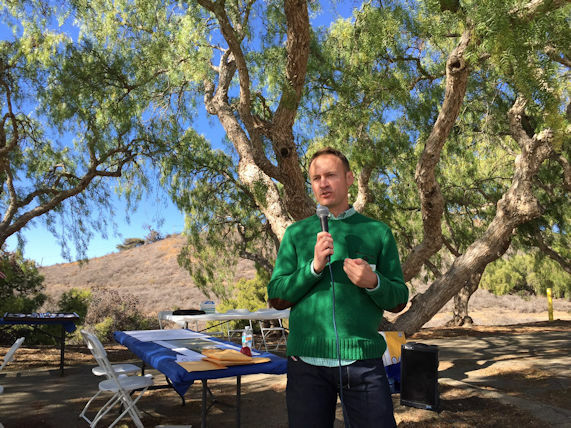 Joseph Cahill, Executive Director of the Gardens addressed the group and outlined the 40-year vision for the 110-acre site with stunning views of the Pacific Ocean. "We have launched the first of nine phases of development," said Joe. "This has the potential to be one of the finest botanical gardens in the western United States." Joe noted that visitors to the site can already enjoy a 1.5-mile trail that climbs the hills behind Ventura City Hall. The first .3 mile is wheelchair-accessible. "When completed," Joe said, "the Gardens will include five sections with plants representing the five Mediterranean climate areas of the world. The Chilean garden will come first." For area Rotary Clubs, including Ventura South, the goal is to contribute sufficient funds to include a dedicated area with benches and an informational station about Rotary and its worldwide humanitarian efforts. For more information about the Gardens, including sponsorship opportunities, visit the website: venturabotanicalgardens.com.